In late November North Korea conducted a ballistic missile test that appeared to show for the first time that it’s capable of striking anywhere on the U.S. mainland. North Korea probably isn’t capable of delivering a nuclear warhead just yet, but new reports highlight that there are plenty of other reasons to be worried about the threat posed by Kim Jong-un’s regime. The U.S., Japan, and South Korea are teaming up in the coming days to test their abilities to track submarine-launched missiles amid fears that North Korea is rapidly developing such technology. The New York Times reports that the drill will take place over two days in the waters between Japan and the Korean Peninsula. Last month 38 North, which tracks North Korea’s weapons developments, said satellite images of the Sinpo South Shipyard from November 5 suggest the nation has stepped up its efforts to create its first ballistic missile submarine. Such missiles are hard to detect before launch, but missiles aren’t the only weapons to worry about. The Washington Post reported on Sunday that U.S. experts are alarmed by North Korea’s strides toward obtaining the knowledge and equipment needed to produce biological weapons. It’s no secret that North Korea is pursuing a bioweapons program, though it’s usually overshadowed by their drive to develop nuclear weapons. Testimony from defectors suggests that the North has been working with biological agents since the ‘60s. U.S. troops headed for the Korean peninsula are routinely vaccinated for anthrax and smallpox as a precaution. 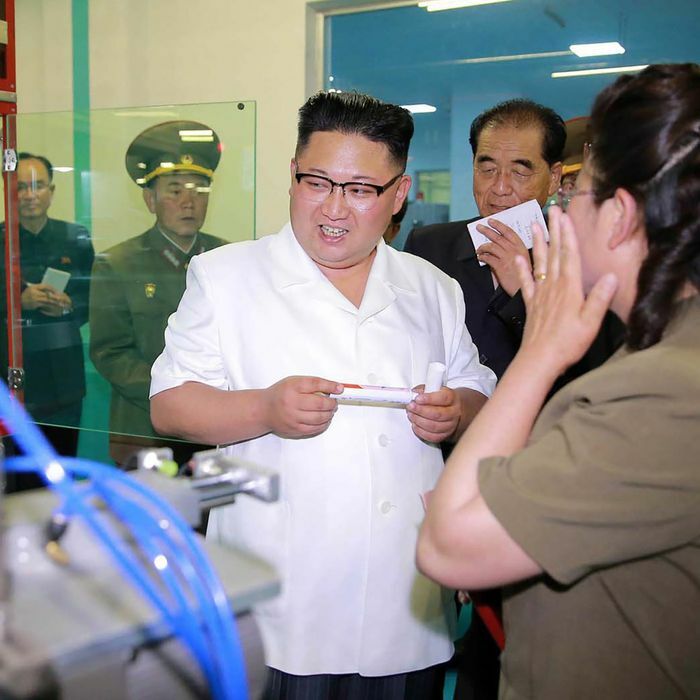 What’s raised new concerns is North Korea’s development of factories that could be used to produce tons of microbes, and labs focused on genetic modification. North Korea has also sent its scientists to study advanced biotechnology abroad. There’s no evidence that Kim Jong-un has ordered the mass production of biological weapons — but it’s unclear why. Though the bioweapons program is even more secretive than Kim’s efforts to obtain a nuclear weapon, he does want the world to know he has many of the pieces in place. In June of 2015 state-run North Korean media broadcast video of Kim’s trip to the Pyongyang Bio-technical Institute. The North claimed the industrial-sized equipment was used to make biological pesticides, but they could also be used to grow microbes in bulk and transform bacterial spores into powder. North Korea likely used liquid VX to assassinate Kim’s estranged half-brother, Kim Jong-nam, in February, but whether the leader plans to use other biological agents as a weapon or just a deterrent is unclear as well. Feltman said there’s still time for a diplomatic solution, but is worried that a miscalculation could lead to conflict. “Time is of the essence,” he said.